With a few simple ingredients you can create a salad with a “Wow” factor! Sugar snap pea shoots have a delicate light flavor and texture that your ordinary greens don’t have. Sugar snap peas germinate quickly, which will allow you to create this salad within weeks of planting the seeds. If the pea shoots are ready during the week use them! Don’t wait for the weekend to create this spectacular salad that is very easy to make. 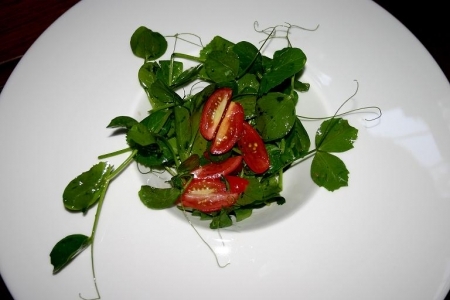 Teach your children how to cut the newly sprouted pea shoots and they will enjoy it too allowing you to concentrate on the rest of your meal. Lemon Infused Extra Virgin Olive Oil is being used and can be purchased on-line at Spicewood Food Company. Ingredient amounts will serve four. Gently rinse and drain pea shoots. Cut grape tomatoes and cut the basil sprigs using the chiffonade technique. Toss all ingredients into a medium size bowl and serve in an elegant dish for the ultimate “Wow” factor! When making any of our gluten-free recipes take care in reading the labels of any packaged or canned products. If there is a label on anything you are using, read it or ask to make sure that it is indeed gluten-free. Many products vary in ingredients from brand to brand. Some examples of this can be found when looking at the labels of soy sauce, mustard, distilled vinegar, and even chicken broth.